Are you the type of player that likes to geek out on tons of controls or are you more of the simple one knob get it done guy? Definitely keep this in mind when you’re checking out reverb pedals. 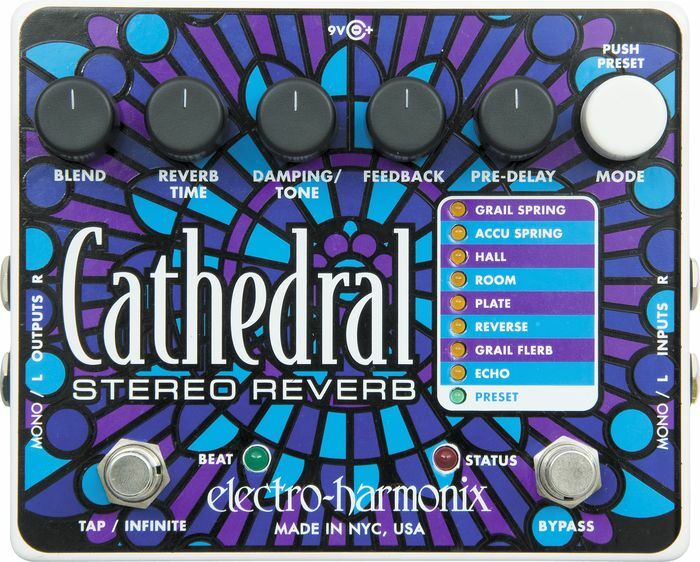 Take something like the EHX Cathedral Reverb with its six knobs and multiple mode settings compared to the Wampler Faux Reverb with a simple 3 knobs. While the more complex one has a steeper learning curve, it will also be more versatile. It really depends on what you like to spend your time on. I like the no fuss, set it and forget it so I value simplicity. Either way, keep this in mind when looking for the best reverb pedal for you! Your budget will also be something to consider. Like with all pedals, reverb effects are no different and have a wide range on the price scale. Take the examples from above. The Wampler or EHX will set you back a bit more than $200 bones while you can grab a TC Electronics Hall of Fame or Boss FRV-1 ’63 for less than $150. You can also opt for the T-Rex Tonebug which costs approximately $100. You can also go the used route and get pedals way for much cheaper. I’ve scored some $300 pedals for $150 that were in great condition from Craiglist and eBay. If you don’t mind a little scuffs or don’t need the nice box and the box candy, go for the used route. The supply is huge and if you stay patient, you can score some great reverb pedals at an awesome price. You can also find new pedals fairly cheap on Amazon compared to Musicians Friend pricing. The majority of reverb pedals on the market today are just digital iterations of the real thing. Think about it, how would you go about fitting a reverb tank on your pedalboard ;). So with that said, when looking at reverb pedals you will most likely be testing out digital ones. Fortunately, the advanced technology we have today seemingly makes these digital versions nearly as good sounding as an analog reverb you would find on an old-school amp sporting a reverb tank. When deciding on the best reverb pedal, always test a couple out if you have the chance. Living near a Guitar Center or small music shop makes things a lot more convenient. They usually have a spot you can hook up and if you’re serious about purchasing and they don’t have it on the floor, they can pull one out for you to mess around with. When you do test it, try to emulate your setup at home. Bring your axe with you and look for an amp that is similar to yours in sound (or if you can find the same amp then go for that). This way you’ll get a true idea of what the reverb effect pedal will sound like when you get home so you won’t run into any buyer’s remorse if you do choose to pick it up right there and then (although most shops have including online ones have legit return policies). If you don’t have the option of testing out some reverb pedals, your best bet is to get on youtube or the vendors site and check out some demos. With youtube, you can pretty much find a video on most popular pedals (not so much the high end boutiques) showing the different options and the sounds they can make. ProGuitarShop has some nice demos. Check to see if they have a video up of the pedals you are interested in. You can also check out comparison sites and read the forums to gauge if the pedal will work good with your style. Keep all of these tips in mind when you decide to go and find the best reverb pedal for you! This entry was posted on Friday, August 8th, 2014 at 12:43 am	and posted in best reverb pedal. You can follow any responses to this entry through the RSS 2.0 feed.